In cultured transiently transfected 293T cells there is a small amount of background with the anti-RFP antibody after 1-2 hrs exposure but no bands could be detected at the correct size for the ARF-RFP fusion (˜40kDa. See attached: lanes 1-3 should have expression, with lane 2 having the most protein) . The blot was then stripped and probed with anti-p19 and a band of the correct size could be detected and was induced to even higher degree in the presence of rtTA and following the addition of doxycycline (lane 2; ARF-RFP is driven from a doxycycline- and rtTA-dependent TRE promoter). Thus I am confident that the construct works and the protein is generated in vitro. If used on transgenic mouse tissue samples, there is more background (as observed with many antibodies) but no band corresponding to ARF-RFP. The lysates were boiled at 95’C for 5 minutes. Yes, our secondary antibody works (checked against other anti-Rabbit antibodies in the lab). I cannot find the purchase order number right now but have emailed our accounts team and will get back to you. I have indeed checked expression under a fluorescent microscope and I see very robust expression in cells transfected with the vector. I hope some of that info helps. Do not hesitate to contact me if you require more information. Thank you for your enquiry regarding ab28664 and for taking the time to provide some useful details of the experiments. I am very sorry to hear that you are having problems with this antibody. The protocol looks absolutely fine to me. I could offer you either a new vial of ab28664 or an alternative antibody against the same target or a credit note which you can use for future purchase. Please dolet me know how you wish to proceed with your enquiry. . I look forward to hearing from you soon. Hi, I was wondering if this product will detect mCherry? We have designed a doxycycline inducible stable cell line in MDCK cells. We use mCherry as one of our controls and need an antibody that will detect it in Western blots. If this antibody is able to detect mCherry, may I also get a quote on this item. To our knowledge, the antibody ab62341 has not been tested for reactivity with mCherry. I suggest trying ab28664, if you only plan to use it for western blotting, because the immunogen sequence, VNGHEFEIEGEGEGR, is 100% conserved in the mCherry sequence at the following URL. This antibody has not been tested for reactivity with mCherry either but we expect it has a higher likelihood of cross-reaction than ab62341, given that the immunogen for ab62341 is full-length RFP (http://www.uniprot.org/uniprot/Q9U6Y8.fasta), which has only 85% identity with full-length mCherry. Click here (or use the following: https://www.abcam.com/index.html?datasheet=28664). Here is the sequence. It would be great if you can check it. Three of our RFP antibodies were raised against immunogen sequences that are 100% conserved in Redstar2: ab28664, ab40740, and ab41336. While we have not tested these antibodies for detecting Redstar2, it is very likely that they would be suitable for that purpose. We are looking for an anti-RFP antibody that will recognise a mutated form of RFP. We would like to check if ab28664 antibody works with RedStar2, made from a combination of T4-DsRed and the RedStar mutant ( Janke et al, Yeast 2004;21: 947-962). 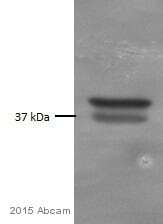 Do you know if this antibody works for Western Blotting on RedStar2 or could we have a small quantity to test. We have not validated this antibody for use with RedStar2. If you could provide the amino acid sequence for this protein I will be happy to check the homology with our RFP antibodies to see if we have one that would be likely to cross-react. Unfortunately, we do not offer free or trial sized samples of any of our products. I am sorry I could not be more helpful, please let me know if you need any additional information or assistance. Will this antibody recognize the monomeric form of RFP? The antibody was raised against amino acids 22-36 of the RFP protein, which is made up of a single 231 amino acid polypeptide chain. The lab said that theprotein doesn't exist in any other form,that it is always a monomer. we wish to purchase the ab28664 antibody. Please send us the discount code fortesting it in ICC/IF and submitting feedback. I am very pleased to hear you would like to accept our offer and test ab28664 in ICC/IF. This code will give you 1 free primary antibody before the expiration date. To redeem this offer, please submit an Abreview for ICC/IF and include this code in the “Additional Comments” section so we know the Abreview is for this promotion. For more information on how to submit an Abreview, please visit the site: www.abcam.com/Abreviews. Hi, I am writing in to ask about the suitability of RFP antibodies on your catalog to probe for a mCherry-tagged protein on WB. Will there be any binding issues? And for EGFP-tagged proteins, are all GFP antibodies able to detect the EGFP on WB? Many thanks. Thank you for your enquiry. Indeed, we do have a few RFP antibodies available that also recognise mCherry and are suitable for Western blot, as stated on each datasheet: ab28664: Click here (or use the following: https://www.abcam.com/index.html?datasheet=28664). ab105750: Click here (or use the following: https://www.abcam.com/index.html?datasheet=105750). ab109809: Click here (or use the following: https://www.abcam.com/index.html?datasheet=109809). To our knowledge, ab28664 has not been tested in specifically tested for cross-reactivity with mCherry yet. However, the immunogen shares a 100% sequence similarity with mCherry and so it is very likely that it will work. Furthermore, we do not currently have an image of ab105750 or ab109809 showing the detection of mCherry. Therefore, I can offer a discount off a future purchase if you buy one of these antibodies now, test it in Western blot with mCherry and submit feedback to us in the form of an Abreview (including an image). It doesn’t matter whether the Abreview is positive or negative, we would just really like to receive your feedback. The discount would be to the value of 1 free primary antibody. If you are interested in this offer, please follow these steps: 1. Reply to this e-mail to let me know that you would like to proceed and which antibody you would like to test. I will then send a discount code. This code must be issued before purchasing the antibody so please wait for my reply before ordering. 2. Purchase the antibody either by phone, fax, or online (www.abcam.com). 3. Test it in WB with mCherry. 4. Let us know the results, positive or negative, using our Abreview system (this will take about 10 minutes and images are great if you have them!). To find out more about our Abreview system, please visit: https://www.abcam.com/abreviews. 5. After the review is submitted to us, the discount code becomes active. Simply place your new order by phone, fax, or on the web and mention the discount code. The discount can be redeemed for any primary antibody ordered and the discount code is valid for 4 months after issue. Regarding the detection of EGFP proteins, I am happy to let you know that most of our GFP antibodies also detect the enhanced GFP. This is also mentioned on each individual datasheet, such as for ab290 (Click here (or use the following: https://www.abcam.com/index.html?datasheet=290).). All of the information we have for each of our products is listed on the online datasheet for your convenience. These are updated as soon as any new information is brought to our attention. Please be reassured that all our products are covered by our Abpromise: We will happily offer Scientific Support in the event that a product is not functioning in the applications and species cited on the product datasheet (and the problem has been reported within 6 months of purchase). If it appears that the antibody is faulty, a replacement, credit or refund will be offered (https://www.abcam.com/Abpromise). I hope this information is helpful to you. Please do not hesitate to contact us if you need any more advice or information. Does this antibody ab62341 recognise mcherry as well ? My colleague had asked about mcherry specific antibodies earlier, and your help team recommended ab28664 antibody - I was wondering if ab62341 would potentially be better as we want to use it in IF ? Thank you very much for your interest in Abcam anti-RFP antibodies. ab28664 was recommended to your colleague because the homology between the immunogen and the mCherry is 100%. ab62341 was raised using the whole RFP, which has 82% homology with mCherry (see attached file). There is therefore a higher possibility that it would not recognise mCherry. To our knowledge, ab28664 has not been tested in ICC/IF. Therefore, I can offer a discount off a future purchase if you buy ab28664 now, test it in ICC/IF and submit feedback to us in the form of an Abreview. It doesn’t matter whether the Abreview is positive or negative, we would just really like to receive your feedback. The discount would be to the value of 1 free primary antibody. If you are interested in this offer, please follow these steps: 1. Reply to this e-mail to let me know that you would like to proceed and test ab28664 in ICC/IF. I will then send a discount code. This code must be issued before purchasing ab28664 so please wait for my reply before ordering. 2. Purchase ab28664 either by phone, fax, or online (www.abcam.com). 3. Test it in ICC/IF. 4. Let us know the results, positive or negative, using our Abreview system (this will take about 10 minutes and images are great if you have them!). To find out how to submit an Abreview, please visit: https://www.abcam.com/abreviews. 5. After the review is submitted to us, the discount code becomes active. Simply place your new order by phone, fax, or on the web and mention the discount code. The discount can be redeemed for any primary antibody ordered and the discount code is valid for 4 months after issue. We are always pleased to obtain feedback about our products and any information is greatly appreciated! Even if ab28664 turns out to be unsuitable for ICC/IF, you will still receive the discount on your next purchase after your Abreview has been submitted. Please let me know if you have any questions about this offer and I would be happy to help you further. The Terms and Conditions of this offer can be found at: www.abcam.com/collaborationdiscount.